This gallery is automatically generated from Wikidata. 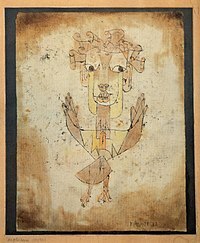 It shows all paintings by Paul Klee with an item on Wikidata that have an image there. The works are sorted chronologically, with undated works at the end/bottom. If you see strange codes instead of text in the gallery below (e.g. Q21646542), it means that that Wikidata-item doesn't yet have a 'label' (name) in your language. You can work on this gallery (add artworks, make corrections) on Wikidata. Changes directly in the gallery below will be removed daily by a bot.